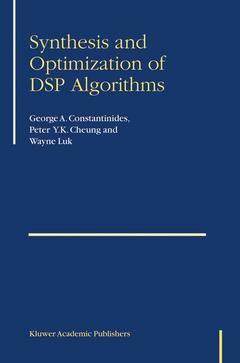 Synthesis and Optimization of DSP Algorithms describes approaches taken to synthesising structural hardware descriptions of digital circuits from high-level descriptions of Digital Signal Processing (DSP) algorithms. The book contains: a. A tutorial on the subjects of digital design and architectural synthesis, intended for DSP engineers, b. A tutorial on the subject of DSP, intended for digital designers, c. A discussion of techniques for estimating the peak values likely to occur in a DSP system, thus enabling an appropriate signal scaling. Analytic techniques, simulation techniques, and hybrids are discussed. The applicability of different analytic approaches to different types of DSP design is covered, d. The development of techniques to optimise the precision requirements of a DSP algorithm, aiming for efficient implementation in a custom parallel processor. The idea is to trade-off numerical accuracy for area or power-consumption advantages. Again, both analytic and simulation techniques for estimating numerical accuracy are described and contrasted. Optimum and heuristic approaches to precision optimisation are discussed, e. A discussion of the importance of the scheduling, allocation, and binding problems, and development of techniques to automate these processes with reference to a precision-optimized algorithm, f. Future perspectives for synthesis and optimization of DSP algorithms. A wide body of literature exists covering separately the areas of DSP, hardware design, and design automation. This book brings together the fields, concentrating on those transformations, optimizations, and design techniques that would usually be considered to cross the domain boundaries between pure DSP and pure digital implementation. As such, this book forms a valuable contribution to the existing literature. Synthesis and Optimization of DSP Algorithms is of use both to researchers and students in the field of design automation for DSP systems, and to those wishing to implement state-of-the-art techniques within an Electronic Design Automation framework. 1. Introduction. 1.1. Objectives. 1.2. Overview. 2. Background. 2.1 Introduction. 2.2. Specification and Computation Pardigms for Digital Signal Processing. 2.3. Architecures for Digital Signal Processing. 2.4. Word length and Scaling Optimzation. 2.5. Architectural Synthesis. 2.6. Summary. 3. Wordlength Optimization for Linear Time Invariant Systems. 3.1. Introduction. 3.2. Algorithm Representation. 3.3. The Multiple Wordlength Paradigm. 3.4. Scaling. 3.5. Wordlength Propagation and Conditioning. 3.6. Noise Model. 3.7. Component Libraries and Area Models. 3.8. Optimization Formulation. 3.9. Complexity of Multiple Wordlength Assignment. 3.10. Heuristic Aproaches. 3.11. Results and Discussion. 3.12. Summary. 4. Saturation Arithmetic :MSB-side Optimizations 4.1. Introduction. 4.2. Saturation Arithmetic Overheads. 4.3. Preliminaries. 4.4. Noise Model. 4.5. Combined Optimization. 4.6. Results and Discussion. 4.7. Summary. 5. Architectural Synthesis for Multiple Wordlength Systems. 5.1. Introduction. 5.2. Motivation and Problem Formulation. 5.3. An Iteger Linear Programming Solution. 5.4. Proposed Heuristic Algorithm. 5.5.Results and Discussion. 5.6. Summary. 6. Conclusion. 6.1. Summary. 6.2. Future Work. A. Notation. A.1. Sets and functions. A.2. Vectors and Matrices. A.3. Graphs. A.4. Miscellaneous. A.5. Pseudo-Code.